Sally prompted us to "draw your focus about the ground; you may be surprised at what you find!" I found this little guy sitting on the ground over in our neighbor's yard, just pecking away at his computer. I wonder what all the other participants found while looking about the ground this week? Peace, Love and Looking About The Ground! How cute! And yes, everyone really is online! 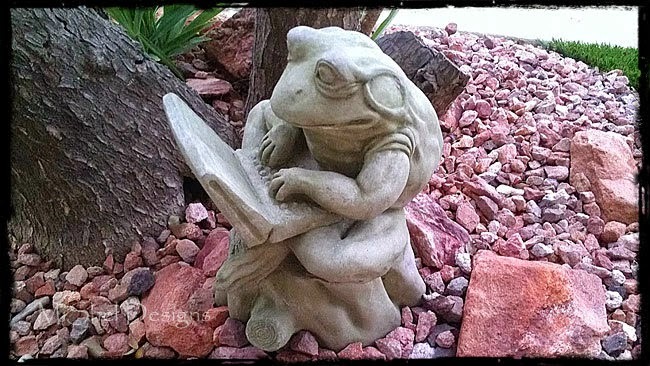 Garden art with a sense of humor! I did find it funny! Cute frog ... he would fit into my garden just fine and my family might not feel obliged to remove him.. my pink flamingos disappeared! That's a cool picture! I love it! Hi there Shel - Sorry for my tardy visit. I was remote this week-end and, for some reason, my comments didn't seem to transmit. Anyhoo - looks like your neighbors have a good sense of humor with Mr. Frog. Also, just LOVE your new ring. It's amazing how the Todd Reed folks captured your design. Plus, I have never seen a black diamond before - gorgeous! Thanks so much Paula - our neighbors really do have a good sense of humor! And thanks for the compliments on my ring! I just love it!